Child Lobbyist: Working To Save Medicaid From Cuts : Shots - Health News The Republican health care bill failed in part because of opposition to shrinking Medicaid. 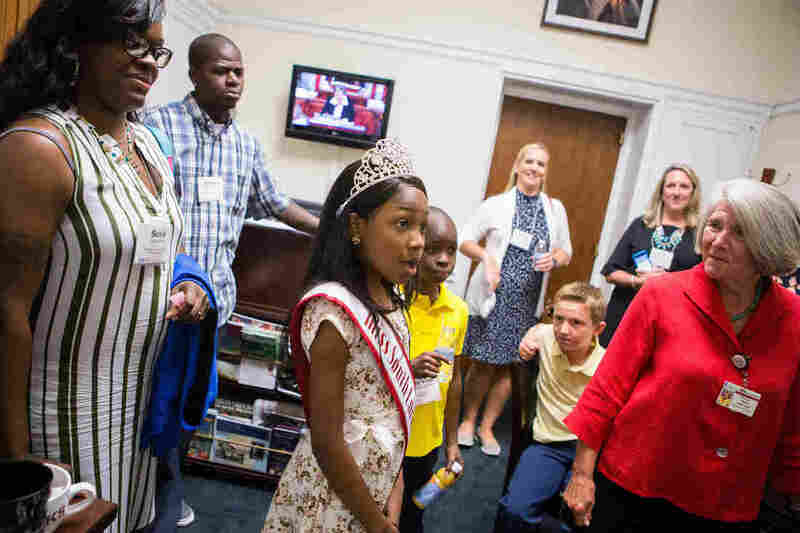 An 11-year-old girl with sickle cell anemia went to Washington, D.C., to make sure that wouldn't happen. 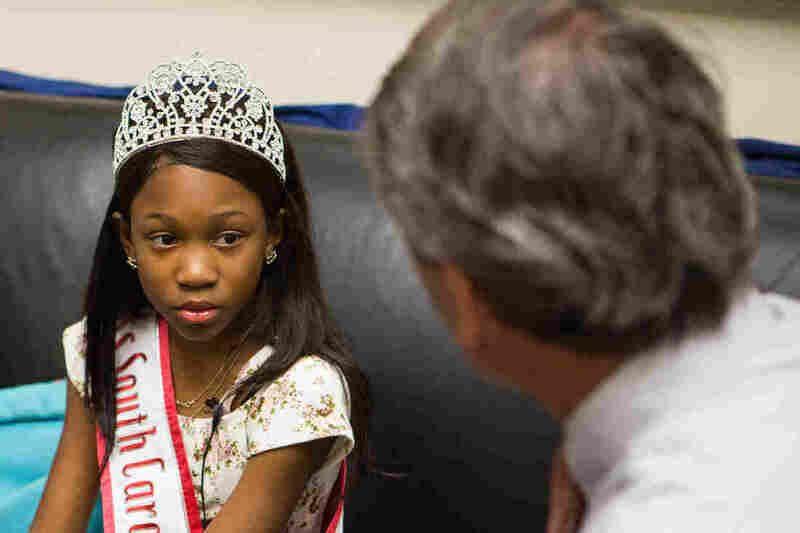 Tymia McCullough is a poised, pageant-winning 11-year-old from South Carolina. She also happens to have sickle cell anemia and relies on Medicaid to pay for medical care. That is because Tymia has sickle cell anemia, a genetic condition that leads to rigid and malformed red blood cells that don't carry oxygen well and can suddenly block blood flow. The painful illness can damage organs, joints and other tissues. It can also be fatal. "Without Medicaid, she would not be here," Pitts says. "She's had two surgeries, 45 blood transfusions, 49 hospitalizations. Medicaid is what pays it." Republican proposals to restructure Medicaid put that care at risk. The plan was to roll back the program's expansion under the Affordable Care Act and to cap spending growth over time. The bill would have reduced Medicaid funding by about 26 percent over the next decade compared with under the current law, according to the nonpartisan Congressional Budget Office. While designers of the bill may not have envisioned cutting off benefits to kids with illnesses, the cuts were so big that analysts say eventually, states would have had to reduce payments to hospitals or reduce benefits for all Medicaid recipients. Dr. Patrick Cawley, CEO of the medical center at the Medical University of South Carolina, where Tymia gets treatment, says 40 percent of his hospital's revenue comes from Medicaid reimbursements. And the South Carolina Children's Hospital Collaborative says 60 percent of the children in that state are covered by Medicaid. Statistics like those led groups as diverse as the American Medical Association, Democratic and Republican governors and even some insurance companies to oppose the bill. The lobbying against the Medicaid overhaul was intense. 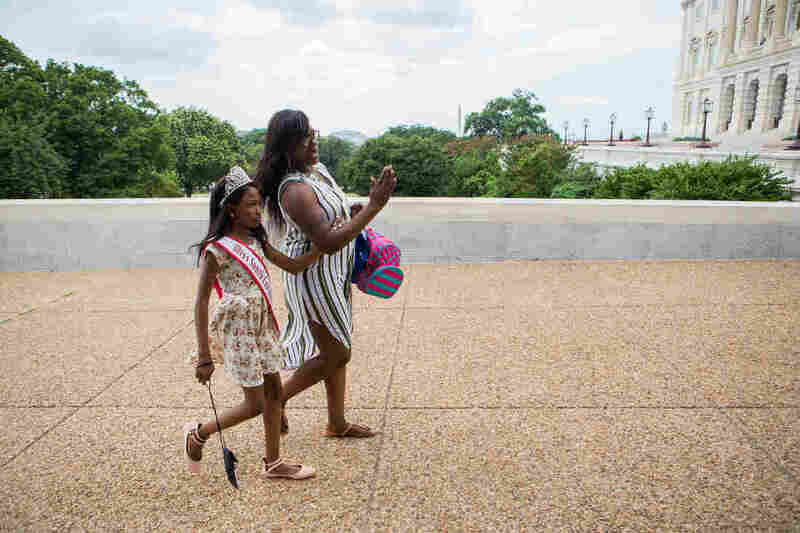 Tymia and her mother, Susie Pitts, head to the U.S. Capitol last week to lobby South Carolina lawmakers on health care, particularly the importance of Medicaid. And it was concern from moderate Republicans over cuts to the program that in part drove the collapse of the Senate bill this week. Tymia and her family were part of a group of 50 families with sick or disabled kids brought to Washington by the Children's Hospital Association. They fanned out across Capitol Hill to meet with their congressional delegations. For Tymia's family, the trip was an exciting deviation from their usual routine in Georgetown, S.C. At home, many days are punctuated by doctor visits and, all too often, trips to the hospital. On the day of her most recent sickle cell crisis, Tymia started out fine, her mom says. "She was having fun. She was dancing." But that good day didn't last. "It started in my left leg," Tymia says. That leg was swollen. Then the pain spread to other parts of her body. "It feels like a knife was just stabbing me, out and in." "And she would start screaming," Pitts says. "And it's a scream that I wish upon no one to hear. And sometimes it's intense — to where I can't touch her, and I'm hurting her just to put her in the vehicle to go get help." The episodes have become so routine that Tymia's father says he now notifies the police when they're headed to the hospital to ensure the family doesn't get stopped for speeding. The group arrives at the Rayburn House Office Building, across the street from the U.S. Capitol, for their first meeting. Tymia is wearing a flowered dress along with the tiara and sash she won in 2015 when she was named queen in the Miss South Carolina Junior Pre-Teen pageant. Tymia enters the office of South Carolina Rep. Mark Sanford, a Republican, as part of a lobbying trip organized by the Children's Hospital Association. Her tiara sets off the metal detector, but the guards wave her through. She immediately walks over to a statue in the lobby. "Sam Rayburn," she says with enthusiasm. "Hi, Mr. Rayburn!" Then they head upstairs for her first meeting with Rep. Mark Sanford, the South Carolina Republican who was once the governor of her state. "I really need Medicaid because it pays for my medical equipment, my fluids that I need, my checkups to see the doctor and [to] be hospitalized," she says looking directly at the congressman. "Please, please do not cut Medicaid, or cap [it]. Because Medicaid is very important to me." Sanford, who opposed the House version of the health care bill, tells Tymia: "I hear you loud and clear on the Medicaid front." Sanford, who opposed the House version of the health care bill, tries to assure Tymia that he is on her side. "I hear you loud and clear on the Medicaid front," he says. "Now don't make me cry. I'm a little emotional this week — my mom died." Then he talks about spending priorities and budgets. He says the system is working well because the bill stalled in the Senate precisely because Republicans could not agree on cuts to Medicaid. Tymia looks straight ahead during the policy talk. Her face is blank, and a single tear rolls down her cheek. Her mom leans in. Tymia becomes emotional while telling Sanford about living with sickle-cell anemia, a genetic condition that leads to rigid and malformed red blood cells that don't carry oxygen well and can suddenly block blood flow. "What if it was you, or if it was your loved one?" she asks Sanford. "What would you do?" A buzzer is sounding in the halls, and his staff is nudging him. He has to get to the floor for an unrelated vote. Tymia and her entourage head to the next office. They'll have four more meetings this day. Late in the afternoon, she arrives at the office of Sen. Lindsey Graham, a Republican from South Carolina. She's in a wheelchair now, tired from all of the walking. 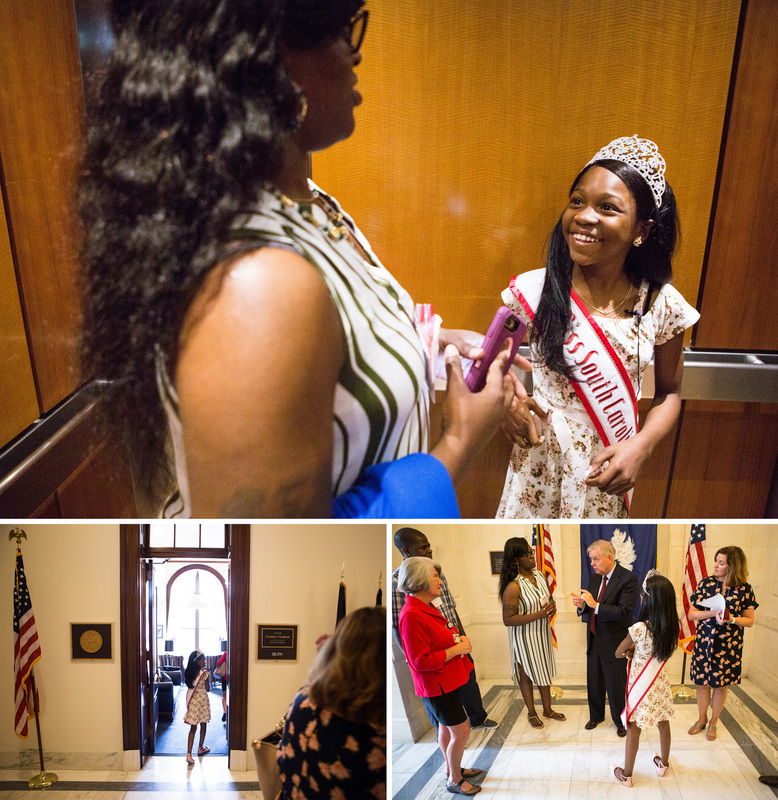 Tymia also stopped by the office of Sen. Lindsey Graham, a Republican from South Carolina, to express her opposition to any health care reform that would curb the Medicaid benefits she relies on. Graham rushes in to say hello. They stand in front of a pair of flags. He tells Tymia she's beautiful and holds up his fist for a bump. The 11-year-old runs through her story. Graham quickly turns to the adult lobbyist from the hospital and starts talking about wonky details, such as FMAP reimbursements and Medicaid expansion populations. When Graham is done, the hospital lobbyist thanks him. He turns to Tymia for another fist bump and rushes off down the hall. 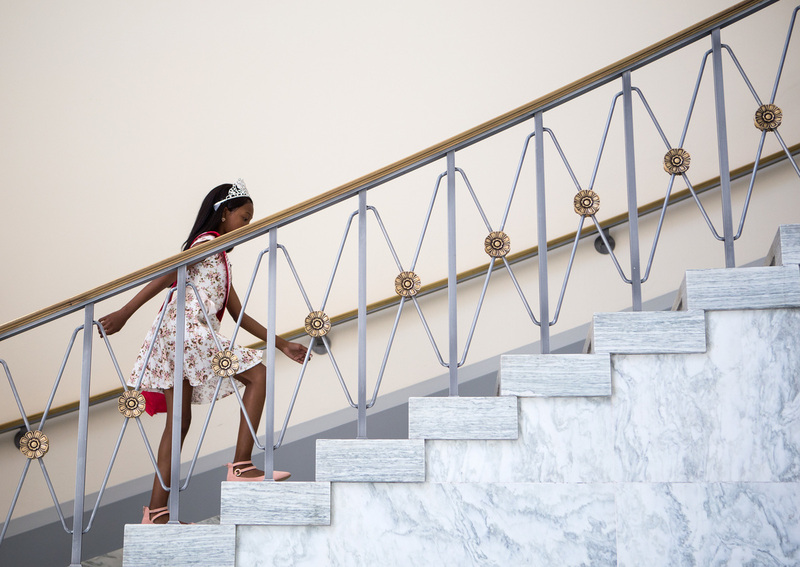 Tymia takes the stairs in the Rayburn House Office Building on her way to meet with Sanford. By the end of the day, she was using a wheelchair. Back at the hotel, Tymia joins the other children in the delegation for a party. There is a band playing kids music, and the kids are tapping tambourines and ringing bells. Her dress and sash are gone, but her tiara is still firmly in place as she picks out a bumblebee and a little camera from a table of toys. "I'm going to enjoy this tonight," she says of the camera. "Go out and get some pictures." Reached this week, Pitts says she is "overjoyed" that the bill failed. "We have been praying that her words did have power and when she spoke from her heart and allowed her words to flow that they would hear her," Pitts wrote in an email. "Our prayers have been answered."